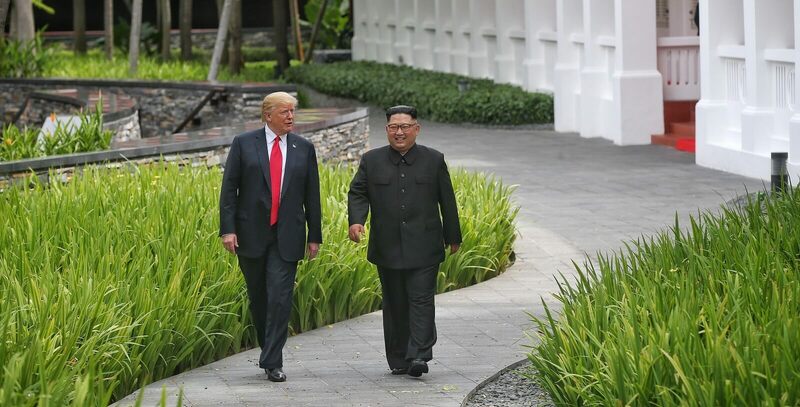 Among many Asia watchers, there is a clear sense of disappointment with the Trump–Kim summit in Singapore on Tuesday. The deal is light on detail. Donald Trump got less from Kim Jong-un than Bill Clinton got from North Korea. Trump made a major concession by pledging to stop joint military exercises, and got nothing in return. You would think, from the tone of these criticisms, that Trump was travelling to Singapore to negotiate the terms of Pyongyang’s surrender. But these critiques belie the weakness of America’s negotiating position. On Wednesday I argued in The Sydney Morning Herald that America’s position on the Korean Peninsula is under unprecedented strain because North Korea now has a missile that can place a nuclear warhead on a US city. But that’s not even the biggest challenge the US faces in Asia. China is an economic behemoth that wants to displace the US as the leading strategic power in the region, and maybe even push the US out of Asia altogether. Does the US have the will and resources to resist these twin pressures? It seems unlikely when you consider the scale of the China challenge (much bigger than the Soviet Union) and the fact that there’s no reason vital to the US national interest to fight China or North Korea. Nor is there a compelling reason for the US to keep its troops in South Korea indefinitely; South Korea can defend itself. Altogether, this means the US needs a deal with North Korea more than North Korea needs a deal with the US. It’s not that the US is totally without leverage. But sanctions will always have limits because ultimately China can open and close the border with North Korea as and when it chooses. The other option is to threaten war, but is that realistic when North Korea can retaliate to US strikes with nuclear weapons? The US has one more arrow in its quiver: it can offer North Korea wealth. “Open up your economy and we will make you and your people rich.” It’s still unclear exactly how enticing this is to Pyongyang, but it may ultimately be more important than the nuclear talks. We’ve become used to thinking of this situation purely as an arms-control effort, but the real agenda may be economic and political. Rather than getting rid of the nuclear weapons, the intent on both sides may be to sideline them in the relationship by developing a deep economic partnership. As unlikely as that seems, it would be a true coup for Trump and the US, and a major blow to China. The odds are stacked against the US in this ongoing negotiation, but perhaps money offers the most promising way out.